GroupM worldwide today published Interaction 2017, a state of the union assessment of digital advertising worldwide with forecasts on technology developments, media marketplace trends and evolving consumer behaviours informed by experts from WPP’s worldwide network of communications, marketing and data companies. The report offers in-depth insights underpinning digital advertising growth forecasts in 46 markets. Topics covered include ad fraud and marketplace integrity, fake news, privacy, ad blocking, artificial intelligence, augmented and virtual reality, video competition across platforms, live video, advanced television, streaming and on-demand audio, and much more. In the report, GroupM’s global chief digital officer, Rob Norman, and Adam Smith, futures director, also share views on media pricing, the consolidation of economic value in media among a small group of companies, and media consumption and e-commerce trends. As reported in its This Year, Next Year, worldwide media and marketing forecast, GroupM predicts that digital advertising will capture 77 cents of every new ad dollar in 2017; TV will capture 17 cents. Despite challenges around standards, measurement and supply chain integrity, digital advertising continues to grow rapidly as marketers follow consumers to the media destinations where they spend their time, and increasingly transact for goods and services. Digital investment has already surpassed TV in ten markets* and another five will cross this bar in 2017 (France, Germany, Ireland, Hong Kong and Taiwan), GroupM predicts. As the competition for consumer attention and advertiser investment escalates, people worldwide are spending more time with media. On a population-weighted average, the overall time spent with media (the ‘media day’) grew by nine minutes to eight hours in 2016, but time spent with online media grew by 14 minutes. This is attributable to the greater access to media that mobile technologies provide. 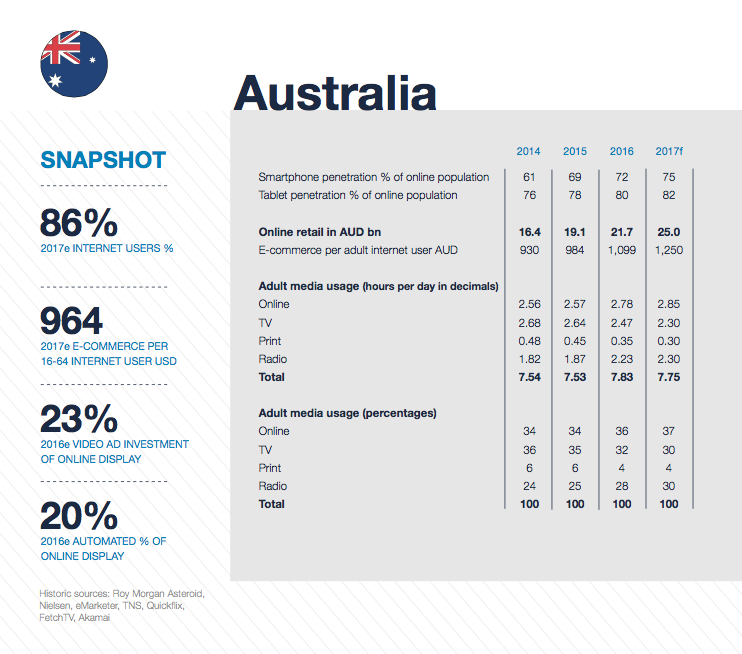 Mobile similarly contributed to the growth of adult internet users to 2.34B in 2016. However, GroupM’s data shows that for now, TV is still king with advertisers when global data is aggregated. TV’s share of advertising investment was largely stable at 42 per cent in 2016; GroupM predicts a share decline to 41 per cent in 2017. TV rode a five-year peak share at 44 per cent from 2010-2014, with only minimal share shedding since then. Still, linear TV demographics continued shifting in 2016, with the loss of the 16-24 year-old demographic remaining one of its biggest challenges. Though the global population of 16-24 year-olds only decreased 1% 2014-2016, the average “tonnage” of the 16-24 linear TV audience shrank 16%, with some markets reaching numbers closer to 30 per cent. GroupM clarifies that some of this loss is exacerbated by TV’s other big challenge – the inadequate measurement of TV’s total audience across platforms. GroupM continues to advocate measurement improvements to better evaluate television across all devices in markets across the globe. The absence of close substitutes means that for now, those advertisers seeking this young adult TV audience can be willing to bear price inflation in proportion to its rising scarcity. In the report, GroupM also examines the coalescing of economic value among six global companies who hold the lion’s share of digital ad spending, with Google and Facebook at the forefront. GroupM notes that these companies have very different business models than the owners of linear TV, and they also attract different advertisers. Advertisers accounting for 90 per cent of TV advertising revenue represent between 30 per cent and 40 per cent of the revenue earned by the digital giants. The other 70 per cent of their revenue comes from a combination of small and local businesses, often ones that trade in digital products or services. This bifurcation among classes of advertisers is subject to change as television becomes more data-fueled and targeted (more like digital) and as video content on digital platforms continues to be enhanced with greater quality (more like TV). Interaction 2017 also looks at consumer purchase behaviours. In 2016, e-commerce totaled USD1.874 trillion, globally, fully 20 per cent more than the USD1.558 trillion logged in 2015. GroupM forecasts 18 per cent growth for e-commerce in 2017, surpassing the two-trillion mark to USD2.205 trillion. On average, online shopping per user is projected at USD869 in 2017. The U.K. remains home to the most active online shoppers, predicted to average USD4,000 per user in 2017. Combined, Amazon and Alibaba represent more than half of all e-commerce (excluding the travel category).